Guinea, officially the Republic of Guinea (French: République de Guinée), is a country in West Africa. Formerly known as French Guinea (French: Guinée française), the modern country is sometimes referred to as Guinea-Conakry in order to distinguish it from other parts of the wider region of the same name, such as Guinea-Bissau and Equatorial Guinea. Guinea has a population of 10.5 million and an area of 245,860 km2. Guinea is a predominantly Islamic country, with Muslims representing 85 percent of the population. Guinea's people belong to twenty-four ethnic groups. French, the official language of Guinea, is the main language of communication in schools, in government administration, in the media, but more than twenty-four indigenous languages are also spoken. Guinea's economy is largely dependent on agriculture and mineral production. It is the world's second largest producer of bauxite, and has rich deposits of diamonds and gold. The first stamps of independent Guinea were issued on 5 January 1959. Before that, Guinea used general French Colonies stamps, the stamps of Senegal and stamps of French West Africa. At the first years since its independent, Post Authority of Guinea issued about 40 stamps a year with design directly connected to the country: local fauna, famous personalities, landscapes etc. Later on amount of stamps produced every year increased rapidly, especially after 2002 when Guinea became a client of Stamperija, who produce many hunderdts stamps on every popular subject, such as Dinosaurs, mostly unrelated to the country. For example: only in 2015 Stamperija produced over 270 Block and Mini-Sheets, that contain almost 700 (!) stamps, on behalf of Guines. Due the fact all these stamps are listed in major stamps catalogues, they are listed on this site too, however they should be avoided from serious collections. Click on image to enlarge it. Stamps on gray background are Undesired/"Pseudo stamps"
Click on year number to see all Paleontology and Paleoanthropology related stamps issued in the year. "American Presidents"  1991 "Surcharged stamps"  27.10.1993 "Dinosaurs"
01.01.1998 "Animals of the world"
27.12.2002 "Scouts and Prehistoric Animals"
24.04.2017 "Neanderthals and prehistoric animals"
* Many of stamps shown above exist as imperforated as well. Within 1991 many stamps issued previously were reused: new values are surcharged. One of these stamps is Smilodon stamp from "Prehistoric Animals" set from 1987. The only set with commemorative postmark on FDC., other FDC are canceled by regular postmark with date of the "issue". Worth to mention, FDC are produced together with the stamp and usually appears on the market, even at Stamperija online shop, much after the date of a postmark used on FDC - actually FDC of Guinea are not First Day Covers, but just a commemorative covers. It is impossible to get really used FDC oft the country. Some dinosaurs are depicted on margins of "Minerals" Blocks. 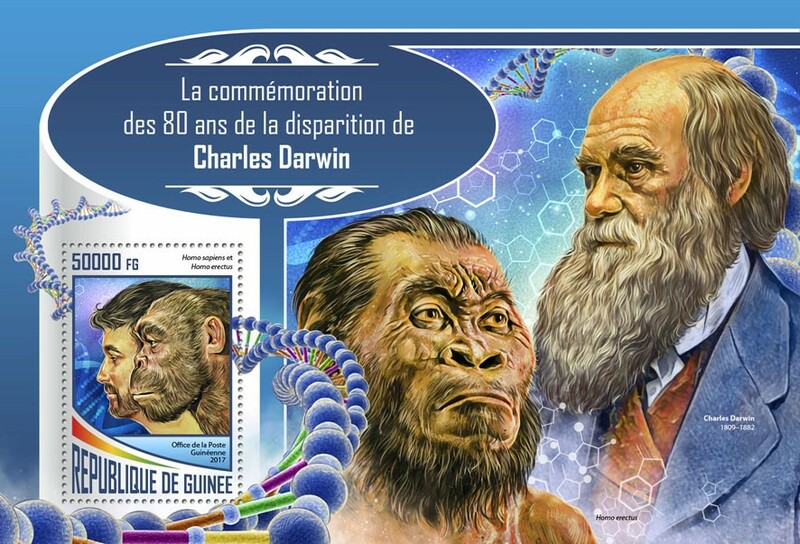 Within 2009 many dinosaur and prehistoric animal stamps issued previously were reused: new values and in most of the cases also a text "200e Anniversaire De Charles Darwin " (200 anniversary of Charles Darwin) are surcharged. Charles Darwin and some Dinosaurs are depicted on one of the stamps at "Scientists" Mini-Sheet. The dinosaurs are: Ceratosaurus described 1884 and Dilophosaurus described 1970. Both was unknown to Darwin who dead in 1882. Ant in Amber is shown on margin of "Ants" Mini-Sheet. Ambulocetus natans shown on the margin of "Whales" Mini-Sheet. Ambulocetus was an amphibious, early cetacean that had reduced limbs that could support it on land and large feet used for paddling in water. It lacked the tail fluke, present in later early whales, and had a pelvis attached to the spine, in contrast to later whales, and, hence, it could walk as well as swim. Along with other members of Ambulocetidae, it is a transitional fossil that shows how whales evolved from land-living mammals. It is also named the walking whale because of this. More info is on Wikipedia. Latimeria (Coelacanth), "leaving fossil" fish is shown on the margin of a block belongs to "Fishes of the World" set. Until 1938 Latimeria was known to scientist from fossil record only. Stamps of South Africa issued in 1989 are dedicated to the discovery. Since than several species are found at South Africa, Comores Islands (many stamps dedicated to Latimeria are issued by the country. "Searching for African Coelacanths" exhibit of Susan Bahnick Jones explain the story of the "leaving fossil" discovery. Conrad Gessner was the first naturalist to write a book about fossils, named "On the fossils objects". Gesner, Conrad (1565) "De omni rerum fossilium genere, gemmis, lapidibus, metallis, et huiusmod"
 "Prehistoric and Present Marine Animals" set contain four Mini-Sheets , each one shows many present and one prehistoric marine animal: skull of some seal, perhaps fossil of prehistoric specie, on the margin, Trilobite, Liopleurodon ferox (carnivorous marine reptile belonging to the Pliosauroidea, a clade of short-necked plesiosaurs) on stamp and margin, Archelon ischyros (prehistoric giant sea turtle) on stamp and margin. Cave paintings of Lascaux cave and a caveman, most likely Cro Magnon man (Homo sapiens), on margin of a Block of "XII Games Cancelled 1940"
 Stylized ammonite on top-right corner of the Mini-Sheet of "MEDAILE WINNERS A.Weil, A.Connes, A.Beker, J.C.Fiels, V.Drinfeld, S.Donaldson, A.Okunkov"
 On October 10 2017, Stamperija on behalf of Guinea, issued a set of Souvenir and Mini Sheet with wrong title title "80th memorial anniversary of Charles Darwin (1809–1882)". Moreover "Homo naledi" on margin of the Souvenir Sheet called "Homo erectus". Later on, Stamperija reprinted the set with correct title "135th memorial anniversary of Charles Darwin (1809–1882)" and correct name of "Homo naledi" on the Souvenir Sheet margin, but called "Homo erectus" on stamp "Homo naledi". One issue fixed, another one introduced.